Flash forward 30 years. The year 2007 provided the most beautiful fall colors I have ever experienced in Central Oregon. 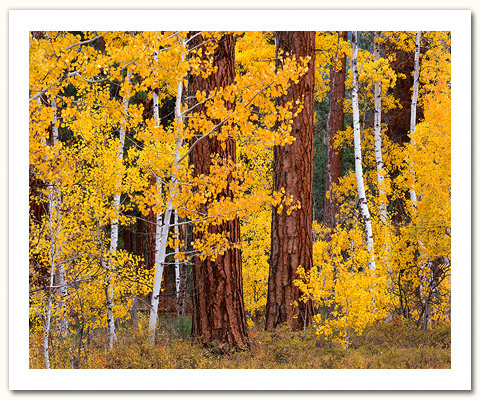 It was during this time I discovered the scene you see here in ‘Speaking Fluent Aspen II.' It was a two day process. The first day consisted of brilliant sunny skies, hours of scouting, and culminated in several photographs taken just after sunset. I use 4”x5” large format film, so the results of my efforts remained unknown in the latent images in my film holders. I was not satisfied.